When the faucet’s valve in the closed position, the water is shut off several inches into the home. The water line does not freeze because of the heat in the home. The product cannot freeze because there is no water in the faucet. When the valve is turned off, all of the water in front of the valve drains from the faucet leaving the tube empty. 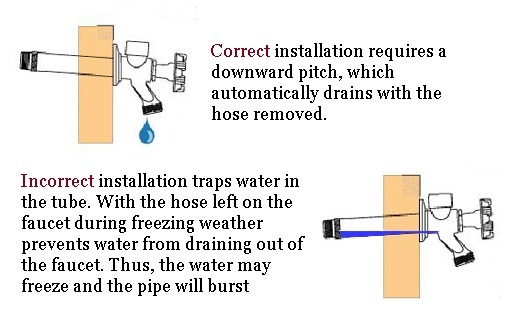 Also shown is correct and incorrect installation and a frozen split tube condition when hose is left on during freezing weather. When a hose or other restriction is left attached, the water cannot drain from the faucet properly. As the temperature drops below freezing, the water in the faucet begins to freeze. The freezing conditions are applied from the outside of the house back toward the interior as the water continues to freeze. Once the water has frozen into the faucet itself, if the faucet has been shut off, there is no relief from this expanding pressure. Eventually the copper tubing will burst to relieve the pressure. No noticeable damage is visible in the home at this time. Only a few drops of water will leak through this bulge at the time of the bursting. Once the weather warms, the ice in the faucet will melt. Since the burst in the tubing is after the shut off valve, water will not leak out of the burst tubing until the water is turned on. Thus, there can be a considerable amount of time between the actual rupture of the tubing and the discovery of the problem. The freezeless Woodford Model 17 is designed and intended for year-round residential irrigation purposes regardless of outside temperature. This faucet will not rupture from freezing when the valve is shut off and the hose is removed. The Model 17 contains an integral backflow protection device which protects up to 125 psi of backpressure and therefore does not require and add-on vacuum breaker. The Freezeless Woodford Model 19 outdoor wall faucet is designed and intended for year-round residential irrigation purposes regardless of outside conditions. A patented pressure relief valve (PRV) prevents bursting during freezing conditions, even if a hose is inadvertently left connected to the faucet. The faucet will still freeze, however it will not rupture. As a result, this product prevents water damage when hose is left on. Welcome spring weather! With the warmer weather comes yard work and outdoor maintenance. When your hydrants drips or the handle seizes, most hydrants are not repairable. They would have to be dug up and replaced. They are usually 4 feet deep or more. Remember in the fall to unhook your hose and cover the faucet with a trash bag and wire wrap to prevent it from damage from the freezing weather.